Two tragedies unfolded last night: one in Canada and one in Oklahoma. Only one of them was prevented from becoming worse, however, thanks to an armed citizen who stopped the killer in his tracks. Two unrelated tragedies—which could’ve been far worse—unfolded last night in the United States and in Canada. In Toronto, Canada, two masked men walked inside the Bombay Bhel restaurant and detonated an improvised explosive device. 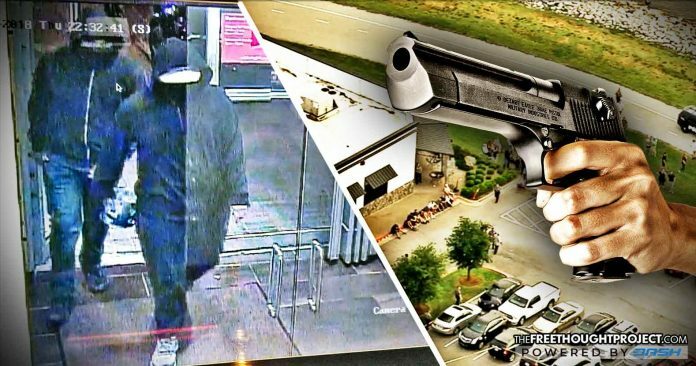 In another incident in Oklahoma City, Oklahoma, a gunman walked into Louie’s Grill and Bar and began shooting innocent civilians. Luckily, no one was killed in either situation. However, only one of these scenarios was brought to a halt thanks to an armed citizen. In Oklahoma, a gunman walked into the restaurant, opened fire and injured multiple people. But it could’ve been far worse. An armed civilian engaged the shooter with a legally owned handgun and killed him on the spot preventing any further injuries or deaths. The “bystander with a pistol confronted the shooter outside the restaurant and fatally shot him,” OKCPD wrote on Twitter. ⚠️ ALERT: The only confirmed fatality is the suspect. He was apparently shot-to-death by an armed citizen. Three citizens were injured, two of whom were shot. A large number of witnesses are detained. There is no indication of terrorismat this point. The customer was outside when the suspect walked into the restaurant and opened fire around 6:30 p.m. local time, Oklahoma City Police Public Information Officer Bo Matthews said at a press conference. A 12-year-old girl and her mother were shot by the gunman, but they are both expected to survive. “We have no reason to believe this is a terrorist type of incident,” Matthews said. The motive was unclear otherwise, and the investigation at the scene was expected to extend into the early morning hours as law enforcement personnel interview about 100 eyewitnesses, he said, according to the Chicago Tribune. And just like that, a bad guy with a gun was stopped by a good guy with a gun and lives were saved. In Canada, however, proving that taking guns out of society will not stop attempted mass murders, fifteen people—aged 23 to 69—were injured by two bad men who made a bomb in a paint can. According to police and witnesses, two masked men walked into the Bombay Bhel Indian restaurant in Mississauga, a suburb of Toronto, with an improvised explosive device in a paint can. They set the paint can down in the middle of the restaurant before running out. The paint can, which according to police, was filled with “projectable objects,” then exploded injuring over a dozen people. Luckily, the two parties full of children inside the restaurant were not hit with the blast. “There is no indication that this is a terrorism act. There is no indication that this is a hate crime at this time. We haven’t ruled anything out as we start our investigation,” said police chief Jennifer Evans. As of Friday morning, the two men responsible for this attack remain at large. In Canada there is no legal right to possess guns. Canadian civilians aren’t allowed to possess automatic weapons, handguns with a barrel shorter than 10.5 cm or any modified handgun, rifle or shotgun. Most semi-automatic assault weapons are also banned. But that didn’t stop these two men from attempting to murder dozens of innocent people with a homemade bomb. It also didn’t stop Alek Minassian, 25, from killing 10 people and injuring 15 others last month as he mowed them down in a rental van. What did stop Minassian, however, was a gun. What these two incidents prove is that crazy people who want to kill will do so with or without a gun and with or without permission from the state to have said gun. However, only one of these incidents was brought to an end with lives saved—and that was solely due to the fact that Americans refuse to give up their right to own and carry guns. Had a similar situation—in which two attempted murderers detonated a bomb or attempted to detonate a bomb—occurred in the United States, it is entirely possible that it could’ve been prevented or the killers stopped by a person with a gun. Indeed, as TFTP reported last week, according to a recent FBI report, good guys with guns—who are not police officers—have stopped multiple mass killings, just like the one in Oklahoma City, and the one in Santa Fe, Texas. According to the FBI report, citizens successfully intervened in eight active shooter incidents in 2016 and 2017. These heroic citizens prevented or helped to stop what could’ve been some of the worst shooting incidents in US history. As the report notes, citizens “safely and successfully” ended the shooting by confronting the shooter—not police. “Their selfless actions likely saved many lives,” the report stated. Out of those eight incidents, four of the heroic citizens were carrying legal firearms and stopped the shooters in their tracks. In two of those incidents, the citizens actually exchanged fire with the shooters, illustrating how a properly trained—and armed—citizen can be an effective deterrent in mass shootings. In the other two incidents, the armed citizens held the shooters at gunpoint until police arrived. The two bombers in Canada could be in custody right now, had they attempted this act in an armed society. However, as most Canadians are unarmed, they are on the loose.